This is the 16th sthalam on the southern side of river Cauvery. Thiruganasambandar has sung hymns in praise of Lord Shiva of this temple. Pullamangai, a small hamlet on the outskirts of Pasupathi Koil of Papanasam Taluk, which is located around 20 kms from Tanjore. This place can be reached either way from Kumbakonam or from Tanjore as it lies in the middle of Kumbakonam - Tanjore route. Durgai statue in this temple is very special. The Durgai is depicted here as Mahishasura Marthini with a stone umbrella standing on the head of a Buffallo. If you have closer look you will find Durgai having multiple weapons in her 8 hands and there are two additional statues of a deer and a lion. It is said that this Durgai is very powerfull and even it is compared with Durgai at Patteeswaram and Thirunageswaram. Sanctum was built in agazhi shape. This temple was ruined during war. Tamil inscriptions are found which describes the Chozha Period renovations. Kamadhenu performed abishekam with milk. There have been too many articles that speaks about the Chola sculptures, but this one is a marvel, simply because of the size in which all this been depicted. I would really like to think this as three dimensional painting done on stone, so smooth, so flawless, so much in details done by our ancestors. The temple is so rich with the epic stories depicted on the stone panels around the outer walls of Gopuram. To quote some - episodes of Ramayana, Vishnu Purana, Shiva puran, Bramha mudi, shiva’s pose as ardhanari, Krishna suckling milk and shiva killing Gajamuhasura. There is also a Durgai’s statue on the side walls of the temple. This temple is a live example or a specimen to the geniusness and creativity of the sculptors of our ancestors especially from the Chola age. The temple’s beauty and reputation lies in the majestic form of Mother Sree Durga in the northern corridor (prakara) of the temple. Speaking volumes of the skill of the sculptor, Mother Durga graces from under a stone umbrella, standing on the head of a buffalo holding weapons as conch, discus, sword, bow, club, trident, armour, angusam the rope. Two men are approaching Her, one chopping his own head and other tearing his lap offering blood sacrifice. While the Goddess is holding the is Lotus Feet is head, bow in one hand, the other hand assures safety with her ring finger touching the thumb, other fingers straight, a sign called chinmudra. A basket with arrows is at Her back. It is said that the Durga idols of Tirupullamangai temple and those in Tirunageswaram and Patteeswaram were made by the same sculptor, all having supreme powers. There are shrines for Chandeswara, Navagrahas the nine planets with Nandhi at the centre and Nalvar – Ganasambandar, Tirunavukkarasar, Sundarar and Manickavasagar. Eagles are ever flying on the top of the tower. This is the place where Lord Shiva made nectar of Aalahala poison that came out of the milk ocean. The sanctum sanctorum is of Agazhi type – Agazhi is a deep water canal security arrangement around a fort with crocodiles put in to prevent enemies entry to the fort. We witness devastating floods even today despite preventive dam arrangements. In those days, when such engineering safety was not available, many of the Cauvery delta villages were ruined due to heavy floods. These natural calamities are recorded in Tirukattupalli epigraphic details of Sundara Cholan period. 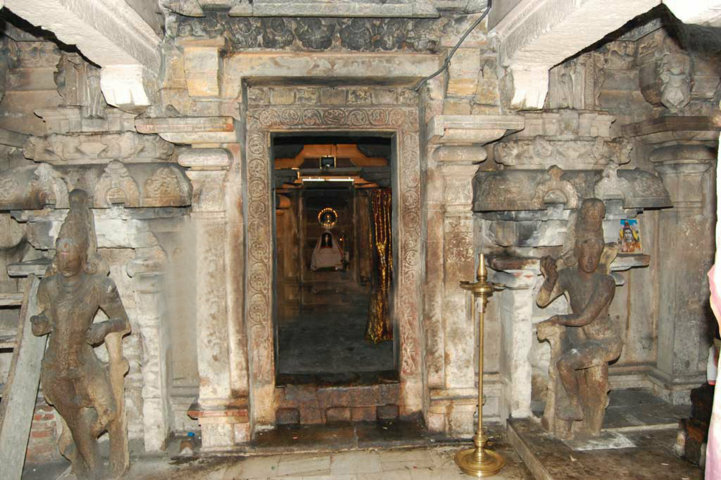 Parandaka Cholan, the great grandfather of Rajaraja Cholan had renovated this temple in Tirupullamangai and other one in Pasupatheeswaram, as found in the stone carvings in pillars. Many of the sculptures as pillars and other temple structures and idols as Chandikeswara, Chamunda Devi on the eastern side of the temple, Jeshta Devi and Nandi represent the Chola period. In later years, rulers of north not only invaded this region but also had robbed invalauable art wealth. These temples were later renovated by Vijayanagara ruler Veera Sumbanna Udayar with sanctions of land for temple maintenance. He also built the five tier main tower – Rajagopuram 65 feet tall that contains a mention in Telugu of this work representing Naicker architecture. The then Thanjavur Maratta king Prataba Simhan, who was paying tax to the Arcot Nawab delayed the payment once. Exasperated, the Nawab, invaded Thanjavur twice. The second army of the Nawab Anwaruddin camped near the Pasupathikoil village and began attacking the temple with a tanker. In retaliation, king’s commander Manojiappa gave a fitting fight and defeated the Nawab and captured him. Thus the place and Pasupatheeswarar temple were subjected to successive calamities and was renovated by the King Pratapasimhan. One can find a mix of Cholas, Naicker and Maratta cultures in the temple now. After the days of kings were over, there was none to take care of the temple and its maintenance leading to its poor condition. Many beautiful sculptures had been robbed and there is no trace of them. The first corridor (prakara) was almost floored off. The Goddess and Her shrine were almost destroyed. Bats were flying. The temple is built in accordance with the Agama rules in the north eastern corner (called Eesanya corner) in the Kallar Pasupathikoil village. The 65 feet tall main tower (Rajagopuram) is very beautiful at the entrance. There are facilities to climb the tower. A Nandhi of the Chola period is on the western side under the Madakoil in a sitting form with its legs folded. Some sculptures are available here and there. There are too many miniature panels and everyone of them were so eye catching with its finesse and details. You have to see it to believe why they are so overwhelming to see it. Some of them were the size of Mobile phone. The whole panel can be hidden by using your both palms, in such a size bringing out the details definitely calls for mastery and proficiency. 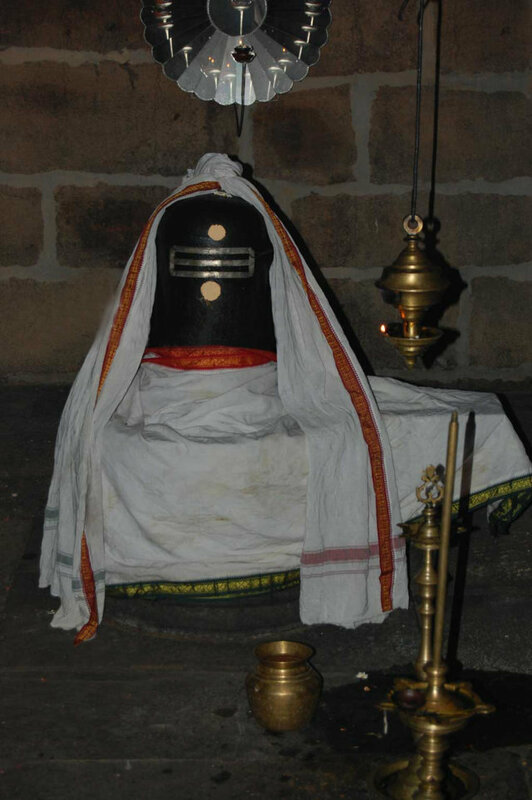 Ardhanareeswarar: This form of Shiva which great saints have praised and sung quite often in their songs and in padhigams. You can see how artfully the sculptor had brought out different looks in one statute. From top to bottom. A single face with multiple expressions. On one side, to be more precise, on the left side where Parvathi resides, it glimmers with softness and kindness, typical of a female. On the other side, that is on the right side, the complete opposite of left, it portrays gallant male look. And if you go part by part, take the head gear, its different, take the ornaments worn in hand, the details are so telling. The best is the hip curvature, you can see how slender curved the Parvathi side has been depicted while the male side is not that much. Its very difficult to miss the artistic details that has been achieved by the sculptor. Had it been sculpted separately, it would look like a picture straight from their wedding album. I mean, the way Parvathi looks in the left half is such a gracefulness and beauty, I am sure most city woman would die to have such a beauty and shape. On right side, like a typical male, Shiva has placed his hand on his vehicle, which is Rishabham and looks like real bride groom giving a pose, with his broad shoulders up and straight. There are two statues one on the Main Vimana and the other one is on the West side of the Garbhagriham. The second one is such as small one, it must be of 8 inches by 3 inches. Battle with Gajamukasura: Legend says that once upon a time there lived a Asura (demon) called Gajamukasura. Gajamukasuran was in the form of an elephant. As all Asuras do, he was bad and evil and ill treated all the good people including the devotees of shiva. Lord Shiva got so annoyed and angry at the treatment meted out to good people, he decided to put an end to this and with his trident had a furious battle with the elephant bodied demon. The battle was so fierce and intense that Shiva was filled with rage and he caught the head of the elephant, crushed it with his foot and skinned him right there and wore it as his garment. If you have a closer look at the sculpture, all the characters in this battle are visible. You can see Shiva in his fierce at the same time with graceful dancing pose on the elephant skin. We can see the elephant’s head down to the left of the sculpture. A closer look will tell you the posture here shiva has taken, which is a slight twist of the torso emphasizing the effort he is putting to peel off the skin and don it as a coat. Just under the Shiva’s trident you can see a Shiva Ghana showing faces at the defeated asura. If you move slightly to the right side, we can see a lady, presumably his wife Parvathi holding a baby, again presumably Lord Muruga, not wanting to see what is happening to the Asura or the child to see it. The scared expression of the Parvathi and the Lord Murga is given in such a detail, kudos to our sculptors. Lord Muruga’s fear can be determined by the way he is trying to jump into another lady’s arms by extending his hands, as if trying to run away from Lord Shiva as well from Parvathi. I think the whole effort has been done here to depict the fearsome expression of the whole act of killing Gajamukasuran. You can see the bigger statue of the same in Vazhudhur at Gajasamhara Murthy Temple, near Mayiladuthurai. It is said we can see the continuation of these carvings in Nageswaran Temple at Kumbakonam. 03. 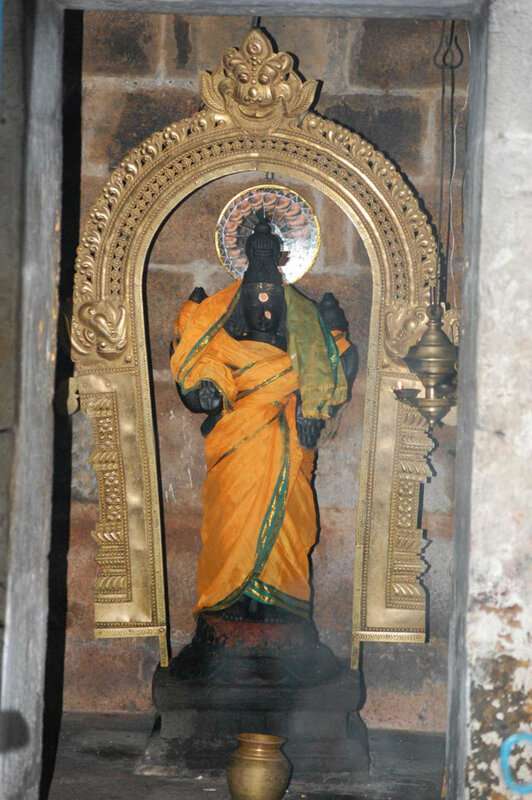 Perumal in Parkadal Sayanam. When you go around the temple, you can see the way the Bhootha ganas have been used in this temple to create an ambience. Most of the ganas here are having a musical instrument in their hands or playing them or dancing to some tunes with various “bhavas” (facial expressions). I was astonished to see the detail of a human riding a Yalli coming out through another Yalli’s mouth. Similarly I saw few other Yallis with their mouths open and some human form coming out of them. This temple is a must see for all those lovers of art and sculpture. This is the fifth of seven temples (Sapthasthana sthalas) praised in the hymns of saint Tirugnanasambandar who lived in the seventh century. Thiruchakkarapalli is the first in this series. These seven temples were worshipped by the Sapthamadhas – Ariamangai,Chakkara Mangai, Shoola Mangai, Nandhi Mangai, Pasu Mangai (Pasupathi temple), Thazha Mangai and Pulla Mangai and also the Saptha Rishis (seven sages). This temple was worshiped by the Divine Cow Kamadenu. This is depicted in a sculpture. The spider begged the Lord to grant him a royal birth and was born as Kochengat Cholan and built temple which elephants could not climb. These temples are called Mada temples. Based on this story and the services of Kochengat Cholan, these events are sculpted in the temple tower in small size. Scientifically too, these Mada Temples are considered a means to protect people of Cauvery delta villages from heavy floods. Location: This sivasthalam temple is located 3 Kms to the north-west of Pasupathi Kovil railway station which is situated on the Thanjavur - Kumbakonam section of the Southern Railway. This sivasthalam is about 16 Kms from Thanjavur. One has to travel on the Thanjavur - Kumbakonam road and get down at Pasupathikoil bus stop and go about two and a half kms. to reach the temple. Town bus facilities are available from Thanjavur. Phone: + 91 97914 82102 ; 80568 53485.